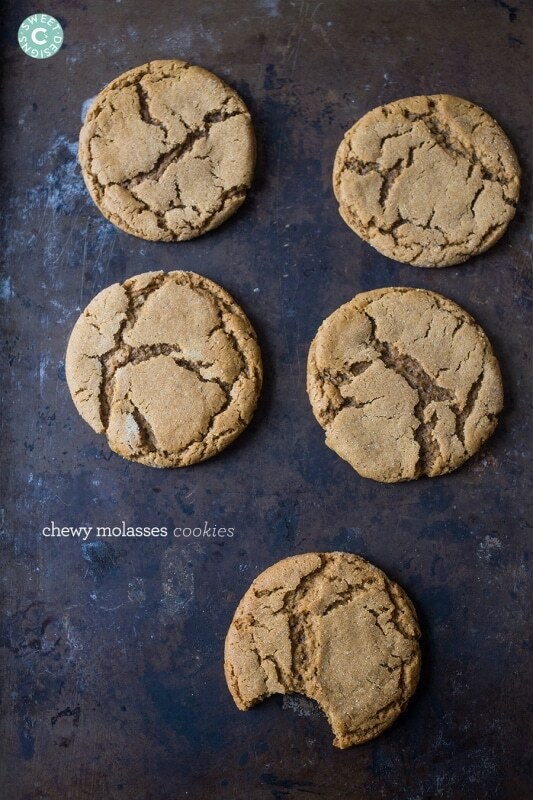 The Best Chewy Molasses Cookies Recipe – chewy, soft, and delicious molasses cookies with plenty of sweet molasses and spicy ginger flavor the whole family will love. There are recipes, handed down over time, that instantly help you connect to childhood. Memories of running wild through our backyard, playing out in the snow until my fingers were ready to fall off, just to come in and be welcomed by the scent of delicious baked goods my mom was making for us. These Old Fashioned Molasses Cookies– a sweet, slightly salty, and ginger-spiced masterpiece- always remind me of special treats my mom used to make for us. My maternal Grandfather grew up in Pennsylvania and loved molasses cookies- my mom used to make them for us as a way to remember her dad. While gingersnaps and crunchy molasses cookies are typically considered a Christmas treat, these chewy molasses cookies are truly year-round delights. In winter they are divine with cocoa or hot cider- and in summer they shine with a tall, cool glass of milk. Not only are these cookies incredibly delicious- they make your house smell amazing. Think of them as potpurri in disguise- when my mom recently made these at her mountainside ski condo, you could smell them throughout the whole building- which made them impossible to resist. Just Take Me To The Best Chewy Molasses Cookies Recipe Already! 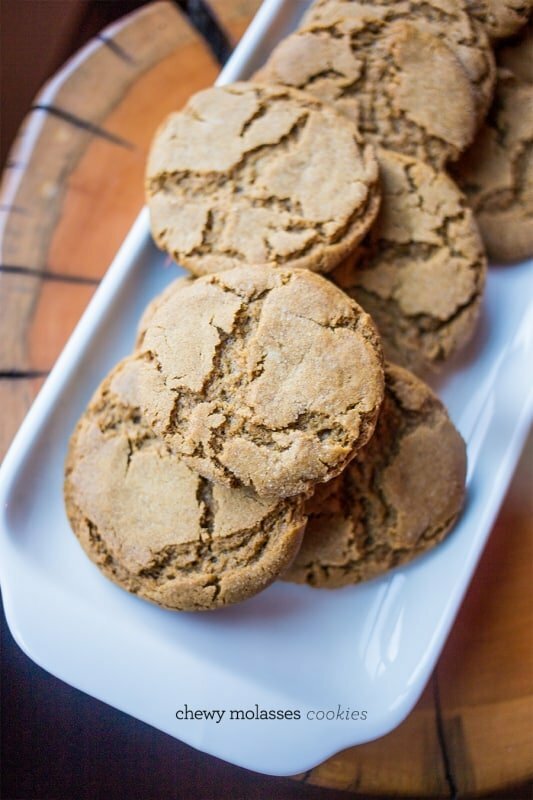 If you’d like to skip my helpful tips and tricks and get straight to the best chewy molasses cookies recipe, please scroll to the bottom of the page where you will find the easy printable recipe. I get a lot of questions about my recipes and requests for similar ideas, so I try to put as much information into my posts as I can. 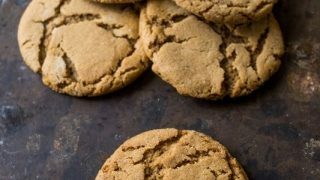 These chewy soft molasses cookies are a breeze to whip up – but there are a few easy tips and tricks to be sure your soft gingersnap cookies turn out perfectly every single time. -Roll dough into balls and place on baking sheets – I like to chill the entire baking sheet with cookies before baking. -Using a stand mixer bowl, beat dough to mix but don’t overwork. Beat in eggs and wet ingredients well into a large bowl, but after adding in flour be careful to not overwork cookie dough. -For extra crunchy cookies, roll in sugar before baking. For mess-free sugar rolling, add ¼ cup sugar to a 1 cup measuring cup and roll cookie dough balls in the cup, which will help to prevent sugar from flying everywhere. -Let Cookies Rest – sometimes it takes a minute for chewy cookies to “set” – so don’t despair if it doesn’t look like it turned out perfect right out of the oven. -Use dark molasses and dark brown sugar. -For a fun twist, try adding up to 1 cup of chocolate chips, 2 tbsp of orange zest, or top with royal icing! 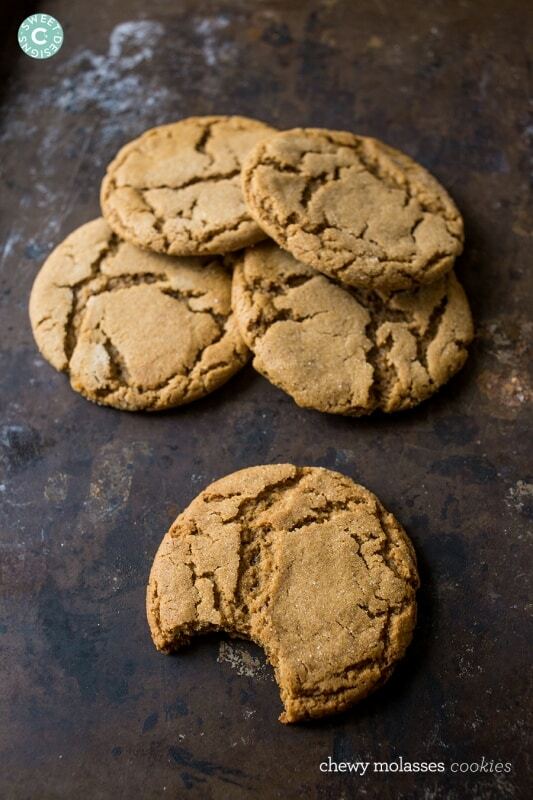 Molasses cookies can be hard to tell when they are done, especially since these cookies are soft and chewy – and molasses cookies are brown to start off with, so it’s harder to watch for light browning on the edges. If you watch for the sides and bottoms to become brown, like you would for a sugar cookie, you’ll likely overcook the cookies by quite a bit. You can tell if your cookies are done by checking to see if the edges are a bit crunchy. To test if your cookies are done, you can gently nudge the sides with a spatula or gently press the edges to test the firmness. You might see a little brownness on the edges. Freezing molasses cookies is super simple with these tips – so if you’d like to bake a bunch of christmas cookies ahead of time, or you can’t get through a big batch you’ve made, you can pop them in the freezer to enjoy a fresh and delicious chewy molasses cookie anytime! For best results, cookies should be frozen from dough in pre-rolled balls of dough. Lay a piece of parchment paper or wax/freezer paper on a baking sheet and place cookie dough balls on top. Freeze dough balls until “set” – about 2-3 hours. Remove balls from baking sheet and place in airtight freezer bag and place in freezer for up to four months. To thaw, place in refrigerator and let come to temp for a few hours or overnight. Bake as called for below. To freeze cookies that have been baked, there are a couple of tips and tricks to make sure you have perfect, delicious, and chewy cookies anytime you’d like them! Let cookies cool completely on wire racks after baking. When frozen properly, these cookies will last up to four months in the freezer. Let thaw naturally in the refrigerator for a few hours to overnight. Soft, chewy molasses cookies are one of my favorite Christmas desserts – they taste like gingerbread, only chewy and soft instead of crunchy. To make these molasses cookies chewy, instead of crunchy, there are a couple of different tips and tricks for chewy cookies. Reduce the spread of your cookies, making them puffier and chewier. As cookies spread when they bake, they become thinner and crisp up more. Chill cookies for 30 minutes in the refrigerator before baking. Butter has a lower melting point, making it perfect for cookies that you would like to crisp up when baking for a buttery crunch. Using shortening will help cookies from spreading more and give a softer cookie. If you love this easy soft chewy molasses cookies recipe as much as I do, please give it a five star review and help me share on facebook and pinterest! Whisk together flour, soda, cinnamon, cloves, ginger and salt. Set aside. In a stand mixer (or with a handheld mixer), beat together butter and sugar on medium speed until light and fluffy, about 1-2 minutes. Add in the dry ingredients and beat together until combined. Roll the dough into 1" diameter balls. Pour 1/4 cup of granulated sugar onto a shallow dish, and roll cookie balls in sugar to completely coat. Place on cookie sheet at least 1 inch apart, and bake for about 8-10 minutes. Cookies will crack at the top, and the centers will still be a bit gooey. Remove from oven and let cool for 2 minutes to firm slightly (if you move them too quickly off the baking sheet, they will fall apart), and then let cool completely or serve warm. Cookies last up to one week in an airtight container. We never had molasses cookies at my house growing up. But I made a similar version to these this year, and they will now be a tradition in our house. So yummy!